"I didn't hurt him," says Karnataka Congress lawmaker JN Ganesh who was allegedly involved in a brawl with his colleague who is now in hospital. A Congress lawmaker in Karnataka is in hospital reportedly with injuries as multiple theories are being bandied about on how he was wounded. Anand Singh was allegedly involved in a brawl with a colleague on Saturday evening at a resort near Bengaluru where the Congress has sequestered 76 lawmakers "to protect them from the BJP". A new version of what went down was "revealed" on Monday by JN Ganesh, the lawmaker accused of hitting Anand Singh on the head with a bottle during their fight at Eagleton resort. He admitted - unlike his Congress party - that there was a fight, but added that it did not quite go the way it is believed so far. "I, Anand Singh and Bheema Naik had a confrontation. We did not beat each other up. The quarrel snowballed. He (Anand Singh) slipped and he suffered few injuries," Mr Ganesh claimed. He refused to answer when asked if he had hit Anand Singh. The Congress, trying to stave off what it suspects is an attempted coup by the BJP, has vehemently denied any fight between its lawmakers. 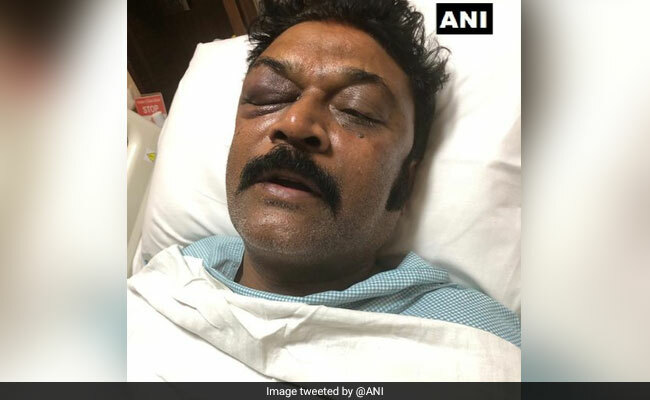 Anand Singh, who has a black eye and injuries apparently from blunt trauma, is in hospital for chest pain, according to the party's DK Suresh. But this morning, Anand Singh's wife threatened legal action against Mr Ganesh. "If it is true that Ganesh beat up my husband, my children and I will not keep quiet and will take legal action against him," Laxmi Singh was quoted by news agency PTI as saying in Mumbai, where she is attending a wedding. Asked if she had been told about the fight, Ms Singh said, "I do not know whether Ganesh provoked my husband, but can anybody try to kill somebody for provocation? Is it right?" She said the two were good friends. Mr Ganesh is believed to be among the lawmakers seen by the Congress as flight risks as it accuses the BJP of launching concerted attempts to topple the Janata Dal (Secular)-Congress government in Karnataka ahead of the national election due by May. "I did not hurt him. It is all a lie. If he's hurt, I along with my family will go and apologise to him," Mr Ganesh said of his colleague in hospital. Two of Congress's 80 lawmakers are still "missing" and have been sent notice by the party for skipping a headcount on Friday. Anand Kumar, who had also been off the grid for days, made a comeback to the party fold last week.